Twitter makes money in two ways: advertising and data licensing. In short, businesses can advertise on twitter news feed. Or enterprises can use Twitter data for their analyses. For the first time in its history, Twitter posted profits, in 2018. This is the right moment to understand and dissect the Twitter, business model. How much does Twitter spend on R&D compared to other tech companies? 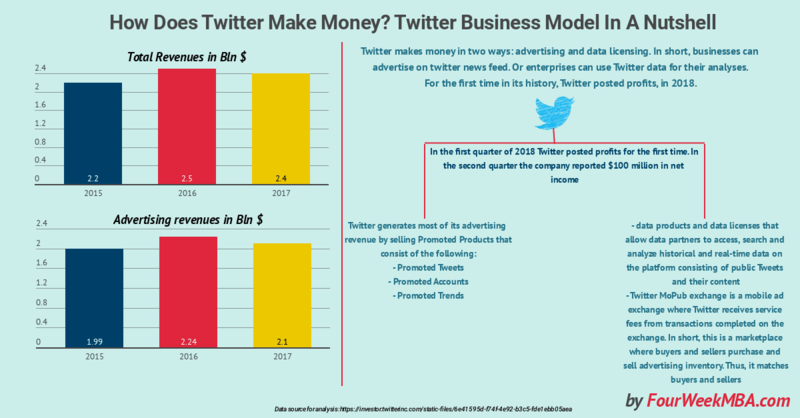 How much does Twitter spend on Sales & Marketing compared to its revenues? Twitter generates revenues via Advertising and data licensing. Based on the Twitter annual report for 2017 the company has grown from about $664 million in revenues to over a $2.5 billion. Nonetheless back in 2017, the company wasn’t profitable yet. Also, if we compare those numbers with Google and Facebook advertising revenues, we can understand the proportion of Twitter. In 2017, Google generated over 95 billion dollars in advertising alone. In 2017, Facebook generated $39.9 billion in revenues from advertising alone. If we look at the overall revenues generated by Google, Facebook, and Twitter from Advertising you understand the proportion of Twitter. Monthly Active Users (MAU) MAUs gets defined as a Twitter user who logged in or was otherwise authenticated and accessed Twitter through our website, mobile website, desktop or mobile applications, SMS or registered third-party applications or websites in the 30-day period ending on the date of measurement. Changes in Daily Active Users/Daily Active Usage (DAU). Daily active users or daily active usage, as Twitter users who logged in or were otherwise authenticated and accessed Twitter through our website, mobile website or mobile applications on any given day. Changes in Ad Engagements and Cost per Ad Engagement. Defined as an ad engagement as a user interaction with one of the pay-for-performance advertising products. In short, once a user completes an objective set out by an advertiser such as expanding, Retweeting, liking or replying to a Promoted Tweet, viewing an embedded video, downloading or engaging with a promoted mobile application, clicking on a website link, signing up for marketing emails from advertisers, following the account that tweets a Promoted Tweet, or completing a transaction on an external website. The change in metrics, such as monthly and daily active users and change in ad engagement can cause the business. User growth trends reflected in the MAUs, changes in DAUs and monetization trends reflected in advertising engagements are vital factors that affect Twitter revenues. Research and development expenses consist primarily of personnel-related costs, including salaries, benefits, and stock-based compensation, for engineers and other employees engaged in the research and development of Twitter products and services. If we look at R&D % over revenues, the 22% from Twitter seems to be high. However, for many in the tech space, Microsoft isn’t any more an “innovative” company. Also, if we look at the absolute numbers, Microsoft has spent $13 billion. In 2017, Amazon and Google spent respectively $22.6 billion and $16.6 billion in R&D. Selling an ad network at the times of Google and Facebook isn’t an easy endeavor. As specified in its annual report, “sales and marketing expenses consist primarily of personnel-related costs, salaries, commissions, benefits and stock-based compensation for the employees engaged in sales, sales support, business development and media, marketing, corporate communications and customer service functions. In addition, marketing and sales-related expenses also include advertising costs, market research, tradeshows, branding, marketing, public relations costs” and so on. The sales and marketing effort is quite considerable, and it took 29% of the revenues in 2017. As of the three months, ending in June 2018 Twitter posted a hundred million in net profit. This is a critical turning point for the future of the company. It is crucial also to remark that since 2015 the company has embarked in a drastic change in terms of objectives and business strategy. I spoke about Omid Kordestani and how he closed one of the most important deals that made Google the tech giant we know today. I believe bringing Omid Kordestani from Google represented the turning point because the hardest challenge from Twitter was to make it profitable.